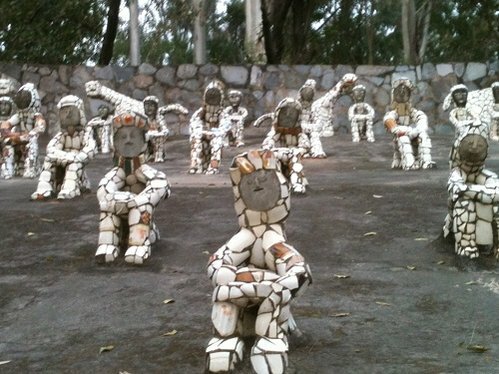 Nek Chand rock Garden is a sculpture garden in Chandigarh. The Rock Garden is spread over 40 acres and features objects like palaces, soldiers, monkeys, village life, women and temples. The material used in creating these masterpieces are largely rocks, boulders, broken chinaware, discarded fluorescent tubes, glass bangles, building waste, coal and clay. 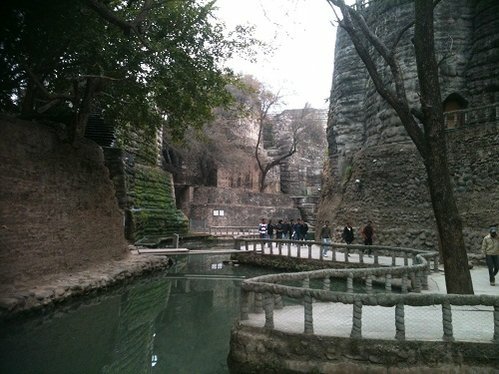 Rock Garden has 14 sections in the lines of Sukrani, a divine kingdom as dreamt by Nek Chand, its creater. The prominent sections are a forecourt housing natural rock-forms, a chamber with a pond and a hut, the main court where the king’s throne is surrounded by natural stone forms depicting gods and even a swimming pool. 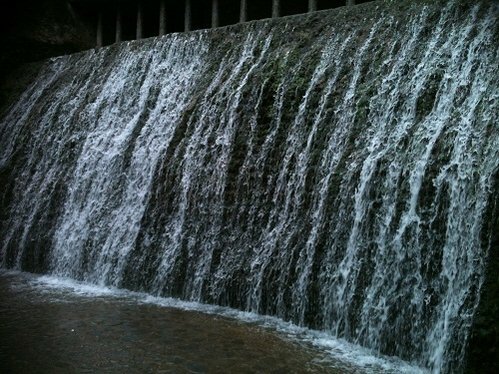 The third phase of the garden features water falls, open air theatre, a village, mountains, over-bridges and pavilions. 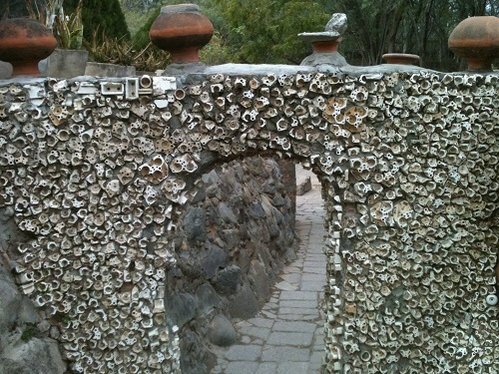 These are connected by small doorways where you need to bend humbly and pass through. The whole landscape is embellished with archways, vestibules, streets and lanes. Nek Chand was a government official. During his spare time, he collected scrap and waste material from demolition sites around the city. 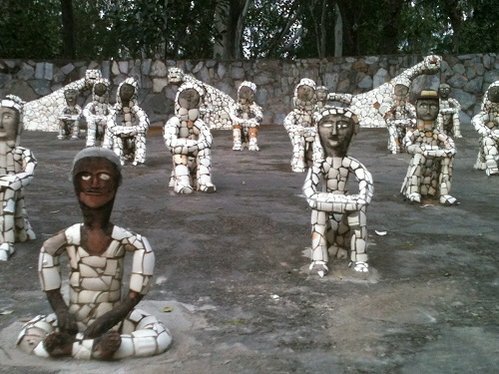 Nek Chand also roamed the Shivalik foothills and picked up stones resembling bird, animal, human and abstract forms. 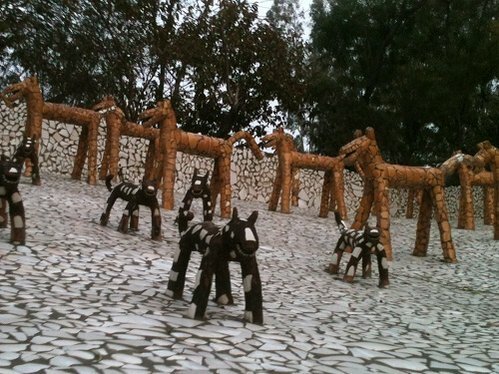 After recycling the materials, he created Rock Garden in 1957, as per his vision of Sukrani, a divine land. What he did was illegal! Remarkably, he kept this secret hidden from authorities for 18 long years. Finally this was discovered in 1975 by the authorities who were contemplating demolition. 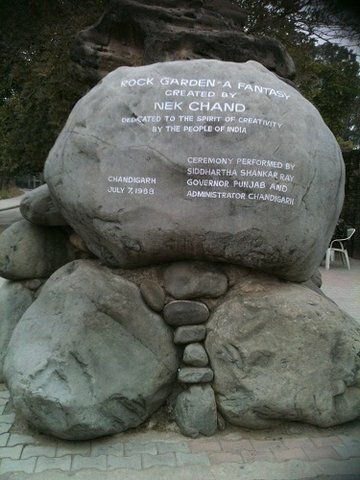 But Nek Chand rallied Public Opinion and was able to get the Rock Garden declared as a Public Space. To top it all, he also got a salary, the title of Sub-Divisional Engineer and a labour force to complete the garden. He was awarded the coveted Indian civilian award, Padma Shri in 1983. Thanks for sharing this, Flash Gordon! I've never heard of this before, and I'm impressed by the inventive art as well as the sheer magnitude of the place. I also appreciate the history of the rock garden. I visited the Rock Garden last April but to be honest was not too much impressed by it. My personal opinion of course and undoubtedly it is a very popular place, both as a tourist attraction and as a function venue. Would it be possible to present the pictures using the 'Insert Image' option? there is some change in the systme i think. Earlier the photos used to open up but now it shows a link! Anyway have used the insert option now. I was not looking forward to a mandatory (health-related) stay in Chandigarh, but now it's at the top of my list! Every country seems to have a variation on this (castles built of wine bottles, etc.) and I've always been fascinated by not only the final product, but by the fertile imagination behind it. Hard to pick a favorite among your photos. One question: does anybody know why this was illegal? Was it constructed on land Mr. Chand didn't own, or...? A friend of mine has talked to me about this place several times. I thought it was more colourful! I visited this 5-6 months back and found it very interesting and worth visiting. Illegal because this was Government land which was abandoned. 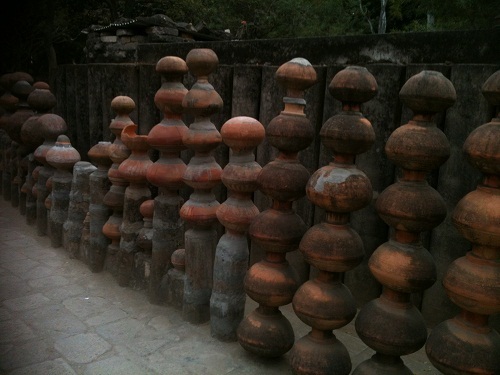 Nek Chand not only trespassed but also rallied public opinion and got it sanctioned as public property!